The Nest 3 and the Ecobee4 are, without a doubt, two of the best known smart thermostats. They lead the way in terms of popularity and sales. But aside from their looks, how are they different? I think that there are 5 main ways in which the Nest and the Ecobee4 are different. The first way in which these two thermostats are different is that the Nest thermostat works with Alexa whilst the Ecobee4 has Alexa built in. Alexa is Amazon’s digital assistant (or Voice) that appears on all of the Amazon Echo devices. Different smart devices, such as thermostats, can be connected to an Echo device and can then be controlled via simple voice commands. And so, if you have an Echo device (such as an Echo speaker, Echo Dot or Echo Tell) you can link your Nest thermostat to it and instead of controlling the Nest via the app on your smartphone, you can control it via your voice. Increase or decrease the temperature. If you want to know more then read these simple instructions. The Ecobee4 has Alexa built in. It doesn’t need to be linked to an Echo device in order to be controlled by your voice. Or perhaps more importantly, if you want to use voice commands to control a thermostat, if you buy the Ecobee4 you do not need to buy an Echo device is well. Just like an Echo speaker, the Ecobee4 will do far more than just control your heating and cooling. It will try and answer a range of questions that you might ask it and it will play your music – but it will play it very badly. But you can find more details here. The second way in which these thermostats are different is in how they are programmed. If you want a thermostat to truly meet your needs, most thermostats need to be manually programmed. This involves creating a 7 day schedule that includes the times that your HVAC system will turn on and turn off and the target temperature. Staggeringly, nearly 90% of American homeowners have admitted that they never program their thermostats because it is just so complicated. Well, the Nest 3 has a solution to this because, instead of needing to be programmed, it will learn your preferences as you adjust the temperature over the first week or so. The Ecobee4 still needs to be manually programmed, which you can do via the app on your phone. The third difference between these titans of the thermostat world are in how they are powered. Most modern HVAC systems include a “C” wire or Common wire. This wire is for modern thermostats that need to have a constant and reliable source of power for such things as their beautiful full color displays or for the WiFi connection. And so the best option for both the Nest and the Ecobee4 is that they are installed with systems that have a “c” wire. These systems have at least 5 different colored wires in them. If your system has a “c” wire, then if you are trying to install the Nest 3, watch this video. If you want to install an Ecobee4, this video will help you. However, if your system doesn’t have a “c” wire, then Nest believe that in most circumstances, the thermostat will receive enough power from the other wires in the system. Ecobee offer a more robust solution for people whose system has no “c” wire. The alternative is in the 4 the form of a PEK (Power Extender Kit) which is included in the original box. A PEK is a plastic adapter that connects to your existing wiring and provides an extra “c” wire. There is a step by step installation video for you to watch. Home Automation is the technology that allows smart devices to connect and interact with one another- it is a basic building block of a smart home. Devices connect to each other by using the same system or protocol and to put it bluntly, the Ecobee thermostat works with more systems than the Nest. Gadgets that connect to other gadgets become more useful and easier to use. For instance, let’s think about thermostats. If you can link your thermostat to a smart bulb in your porch, which is set to come on 15 minutes before a person comes home. If when the light comes on the thermostat also starts, a tired owner can be welcomed by a well lit porch and step into a warm home. IFTTT is an amazing app and connecting smart devices together is just part of what it does. This is not the place to explore it in too much detail (but I have done that here) because it is only important to state that both Nest and Ecobee use this app. Alexa was discussed in lots of detail earlier and so I will keep this brief. As discussed earlier, Nest is compatible with this voice activated system- as long as you have an Echo device to use it with. Ecobee, on the other hand, has this system built in. Google Home is Google’s version of Echo. Google Home is the name of the range of interactive speaker which are powered by Google Assistant- Google’s voice. Both of these thermostats are compatible with Google Home- as long as you have a Google Home. Amazon Echo and Google Home as well as being interactive speakers, are smart home hubs with a rapidly growing number of devices that connect to them. HomeKit is Apple’s voice activated smart home system. The hub of your HomeKit system is your iPhone and it’s digital assistant, Siri. The Ecobee4 is compatible with this system, but the Nest 3 isn’t. Both of the thermostats in this comparison are compatible with Wink. Wink is one of the most established names in smart home systems. These systems have a smart hub at their centre. These hubs do not have a built in digital assistant that can be controlled by your voice. Instead they are controlled via an app on your smartphone. Only the Ecobee4 is compatible with SmartThings. Like Wink, SmartThings is another long established smart home system and it is controlled via a smart hub that doesn’t have a built in digital assistant. The fourth way in which these two leading smart thermostats are different relates to their design and display. These thermostats both have color touch screens although they are different. The Nest 3 is an oval shape and it’s screen size is just over 2” (53 mm) in diameter, with a resolution of 480 x 480 pixels. The Nest can be controlled by pressing the screen and rotating the dial on the outside of the thermostat. The Ecobee4 is rectangular and its screen size is 3.5” (89mm) in diameter and has a smaller resolution of 480 x 320. It is controlled by touching the screen. Both thermostats use proximity sensors so that as the thermostats are approached, the screens light up. The fifth and final difference between the Nest and the Ecobee4 is in how they interact with sensors. The Ecobee4 is compatible with sensors but the Nest 3 isn’t. They are located in different rooms around a house or office and they monitor temperature and motion, information which is fed back to the thermostat. By measuring temperature, the thermostat has a much more accurate “picture” of the temperature around the whole house and it can make adjustments accordingly. By monitoring motion, a thermostat knows if a room is occupied or not and can then decide if the temperature needs to be raised or lowered. Sensors make smart thermostats even smarter. They provide more information which in many cases will lead to people saving money on heating and cooling. To finish off this section about how the Nest 3 and Ecobee4 are different to one another, I will briefly mention other less important ways that they are different. The Ecobee4 is a much younger thermostat than the Nest 3 as it was launched in April 2017: 18 months after the Nest 3. The Ecobee is only available in black whereas the Nest is available in four colors- black, white, silver or copper. The Ecobee has a three year warranty whereas the Nest 3 only has a two year warranty. Now that we have closely examined the ways in which these thermostats are different, let’s take a closer look at the main ways in which these thermostats are the same. The first way in which these two thermostats are similar is in their HVAC compatibility. The Nest and the Ecobee4 are designed to work on 24V systems- which are the most common types of systems found in US homes. These thermostats are not compatible with millivolt or electric baseboard systems. They will work with conventional and heat pump systems and with gas, electric, oil and dual fuel systems. With conventional systems, the Nest 3 and the Ecobee4 will work with 2 stages of heating and 2 cooling. With heat pump systems, both thermostats work with 4 stages of heating and 2 cooling. These thermostats will work with accessories such as humidifiers and dehumidifiers. To check the compatibility of your system with an Ecobee4, visit this page. For a Nest 3, start the step by step guide here. The second way in which these thermostats are similar is that they both use WiFi to connect to the Internet. The third way in which these two thermostats are the same is in their energy saving and weather forecasting capabilities. One of the greatest attractions of smart thermostats is in their promise to save energy and money. Nest believe that their thermostat could save you up to 12% on heating and 15% on cooling bills. That prediction has been made after gathering lots of data from their users. Ecobee’s thermostat could save you up to 23% on your bills. Both the Nest and the Ecobee thermostats have a variety of features which include tracking your energy usage and producing monthly reports. You can use these reports to make changes to the way that your house is heated or cooled in order to use less energy. The Nest 3 and Ecobee4 also have a 7 day weather forecast, which is a forecast specific to your zip code. The fourth way in which the Nest and Ecobee are the same is in the apps that they use. The Nest and the Ecobee can be remotely controlled via apps for your iPhone and iPad and apps for Android smartphone and tablet. If you want to connect to the Nest 3 using your Apple device, it will need to be running iOS9 or later. The requirements for the Ecobee4 are exactly the same. The thermostats have matching requirements for any Android device, which is that it depends on the device that you are using. That is frustratingly vague but a quick way to check it is to visit the Play Store on the device that you want to use and search for the Nest app, then the Ecobee app. It will tell you if you device is compatible or not. A third way that the Nest 3 and Ecobee can be connected to is by using a web browser on a laptop or desktop, a Windows machine or Mac and log into your online account. And the final way that the two thermostats in my comparison are the same is because they both have a Home/ Away function. Home/ Away or Geofencing as it is also called, uses a smartphone’s location as a means of turning the thermostat on or off. As part of the setup process for Home/ Away, on a virtual map of your neighbourhood you create an invisible fence. As you leave home, when you cross this line, your thermostat will turn off. As you return home as you cross this line, your thermostat will turn on. This feature is perfect for people who never seem to remember to turn off their thermostat as they leave the house and for users who love coming home to a warm house- no matter how unpredictable their schedule is! And that’s it, I have finished explaining the most important ways that the Nest 3 and Ecobee4 are different and similar. To finish this comparison, I will list the pros and cons of each thermostat together with my final verdict. In all honesty, very little separates the Nest 3 and the Ecobee4 apart from price. They both look great and work exceptionally well. I think that if you have been thinking about buying an Amazon Echo device, because you like the idea of voice control, then you might opt for the Ecobee over the Nest. But, if you like the idea of a thermostat that will create a unique schedule just for you, then you might be swayed by the Nest 3. 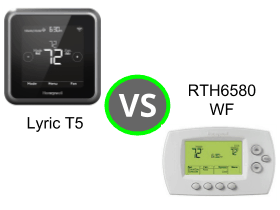 RTH6580WF vs Lyric T5- Age before beauty? RTH9585WF vs RTH6580WF- Could You Live With An Ugly Powerhouse? Sensi Thermostat: ST55 vs UP500W- Do you live in an Apple Smart Home? Ecobee3 vs Ecobee3 Lite vs Ecobee4- What Are The Differences? !